This is a very old photograph from my school when I was in the 2nd standard. Can you spot me? 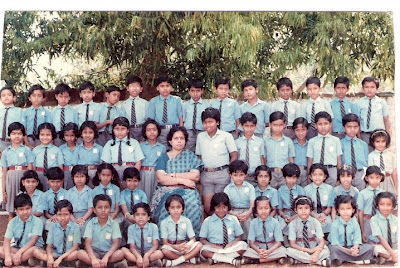 top row 1st from right hand side ??? @Amit: 1st, 2nd or 3rd? ohh....then u r either 2nd or 3rd ? Hahahaha, Well, it's definitely not the 1st. And I was a lot lot slimmer than I am right now. then u r the 2nd one ..... bottom row left corner. @Amit: People have pointed out the right me. :) It's just that you will have to look closer. he he.. better I will meet you again, and see you closely :-) will probably be coming to b'lore in september..
Hehehe... Yeah, What do you mean by "rilli" ?? ?